We had some new speakers, some new headphones, and a lot of people who like Airpods. It didn’t feel like it but there was a decent amount of news that happened last month. Even I didn’t realize how much there was until I sat down to look at all. In case you (like me) weren’t able to keep up with all that happened let’s recap. 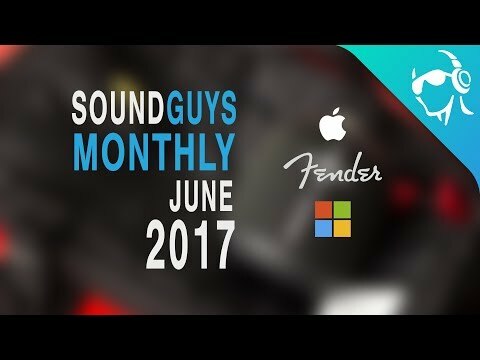 This is Sound Guys Monthly. Probably the biggest news in audio was the announcement of a brand new speaker from Harman Kardon that has Cortana built in. We covered this a few months ago, but they were only vague rumors. Now it’s official. The speaker will have Cortana baked in, kind of like Alexa on the Echo or the Assistant on the Google Home. It’s voice activated with 360-degrees of sound and will likely sound quite a bit better than its competitors considering that it has three woofers, three tweeters, and two passive radiators. Unfortunately, we’re still waiting on pricing but it’s expected to be released sometime this fall. If you like the minimal modern of B&O Beoplay speakers but wanted something a little more portable than the Beoplay A1 we reviewed, then the new P2 might be for you. This small Bluetooth speaker can fit in the palm of your hand, making it perfect for throwing in a bag or maybe even your pocket if they’re big enough. It has a claimed 10 hour battery life, a single multifunction button, splash and dust resistance, and you can even change the song by shaking it. Seriously. If this sounds like something you want you can get one now for $169. So although the Airpods were kind of impressive in terms of connection, I really just couldn’t see myself using them. But apparently there are plenty of people, maybe even some of you, who really like them. A new survey from Experian shows that 98% of people who bought the Airpods are satisfied with them. And sure it’s only one survey and they were actually testing the adoption of voice-first interfaces like Siri and Google Assistant, but it’s still pretty surprising. Fender, the company you probably know because of guitars and amps, announced a few more amps last month. And a pair of headphones, but first let’s talk about the amps. There are three new amps that were announced, the Mustang GT 40, 100, and 200, each varying in size but all with Bluetooth and Wi-Fi capabilities for playing music off your phone like any other Bluetooth speaker, or using it as an actual amp for your guitar. There’s even a new Fender Tone app which can change the sound of your guitar as you play. The GT 40, 100, and 200 cist $249, $399, and $599 depending on which size you choose. If speakers aren’t your thing they also announced a new pair of in-ears dubbed the FXA9 Pro. These are a little more affordable at around $1299. Yeah, so not affordable at all. But if you trust in the company’s legacy which many do, chances are these might be worth the money. So the weather is getting nicer and chances are you want to go outside and enjoy it, but why not just stay in and watch some movies instead? for the lazy days, a good sound system can really make or break the experience. But you don’t need a giant expensive soundbar to drastically change your TV experience, make sure to check out our guide for the best budget soundbars. This month we reviewed and unboxed a few things, but the one that stuck with me the most personally was the Quad-Driver in-ears by 1MORE. The company had huge success with the Triple-Driver in-ears, and Quad-Drivers take that legacy and run with it. They sound really good and have a build quality to match, but the kicker here is the price. At $199, they’re not cheap and I’d say the Triple-Drivers are a better value. But as far as Quad-Driver prices go, $199 is a steal so if that’s what you’re after these are an easy recommendation. Now that warm weather is here, you might want to invest in a good Bluetooth speaker for the beach or pool, and the new UE Wonderboom doesn’t even cost a lot. Which is why we’re making it our bang for your buck pick. It’s IPX7 waterproof so if it gets submerged you won’t have to worry about it, but better than that it floats. So even if you drop it in the pool or in the ocean you can get it back as long as it doesn’t float out to sea. It might not be the best speaker but for only $99, it’s probably worth it. Last month we were giving away a pair of Grado SR60e headphones, personally one of my favorites. And we have picked a winner. Colin Y. from the UK, congrats on your new headphones we hope you enjoy them! Now this is usually the part where I tell you about another giveaway we’re doing for Sound Guys Monthly, but not this time. Why? Because we wanted to do more than just the monthly Sound Guys giveaways. So instead of just having a giveaway here once a month, we can do a random giveaways at any time whenever we want. This will hopefully get more cool products into the hands of people who really care about audio, i.e YOU. We could do a giveaway in a review, or a best list, or a news article, or anywhere really. So if you want to keep up with all the giveaways we’re doing make sure to check out the brand new giveaways page whenever you can!